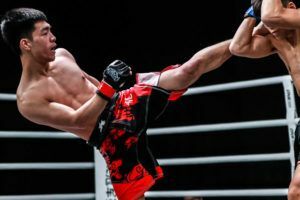 Lightweight King of Pancrase Takasuke Kume put on a lights out performance in his latest title defence in the main event at Pancrase 304 in Tokyo. 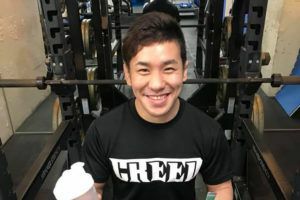 Kume stepped inside the cage for the first time since last year when he suffered a TKO loss in a non-title fight to Anton Kuivanen at Pancrase 297. 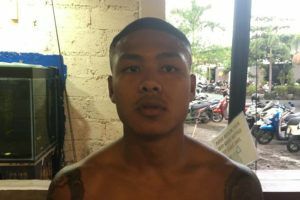 It was a tough loss for Kume after he had rattled off five straight wins and he wanted nothing more than to get back on track in his fight against Tom Santos. 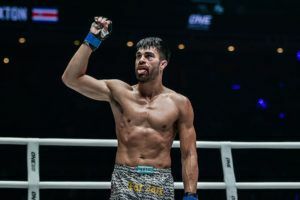 The long road back over the past nine months finally led to his title defence this past weekend and Kume made the most of it with a lopsided performance that ended with a third round submission. Kume wasted no time taking Santos to the ground as soon as the fight got started as he ploughed forward with a big right hand before taking his opponent to the mat. Once the fight was on the ground, Kume showcased a dominant ground and pound attack as he was constantly peppering away at Santos, who was stuck on the bottom playing defence. 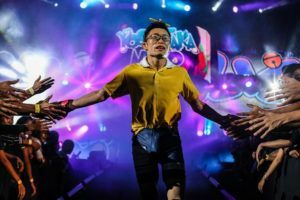 It was a steady attack of punches and elbows coming from Kume throughout the first round while pushing Santos against the fence to prevent him from finding any kind of an escape. As the barrage continued, Santos struggled to do much of anything to counter the attack from Kume, who eventually opened a cut on his face while battering away on the ground. After taking round one, Kume duplicated his game plan at the start of the second as well, immediately pressing forward and then planting Santos with a huge double leg takedown. Less than a minute had expired and Kume was already in complete control as he once again opened up with a ground assault that had Santos seemingly helpless on the mat. Kume was always staying busy with his offensive onslaught, which prevented the fight from ever getting stood back up to the feet. It was an exhausting performance from the reigning King of Pancrase while Santos was just locked underneath him trying to survive. At the start of the third round, Kume seemed a little more willing to exchange punches with Santos and that’s when he slammed home his best shot of the fight. 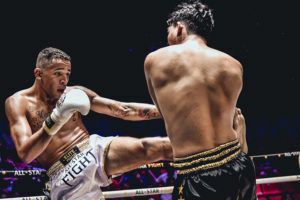 As Kume was coming forward, he launched an overhand right that blasted Santos on the chin, twisting his head around as he crashed down to the canvas. Kume looked for the finish with punches but Santos recovered enough to stave off the TKO. It was short lived success, however, as Kume was on the attack and he had no intention of allowing this fight to make it to a fourth round. 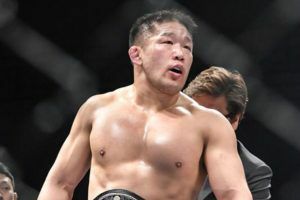 Once Kume had control on the ground, he moved into mount and then locked out a triangle choke from the top that gave Santos (11-7) nowhere to go. A split second later he tapped out and Kume (22-6-3) jumped up in celebration after finishing the fight just a minute into the third round. 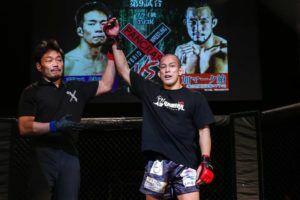 It was a completely dominant showcase for Kume, who wanted to bounce back after suffering a TKO loss in his last fight. 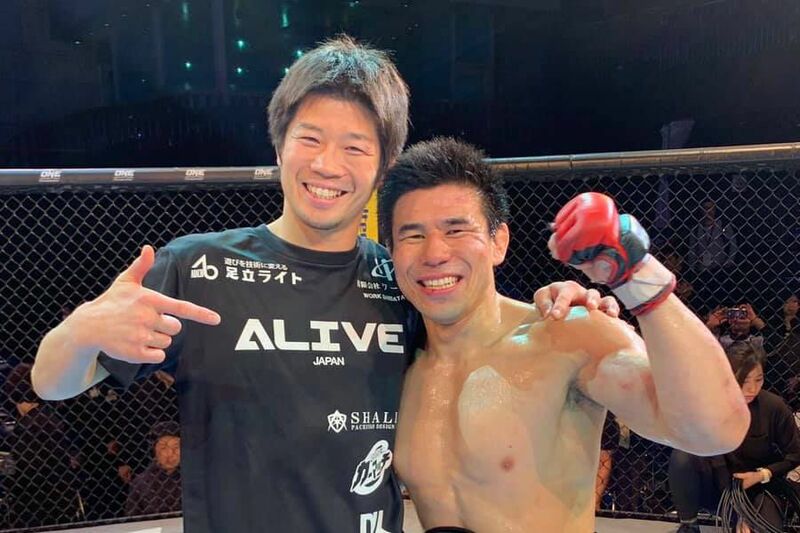 With the win, Kume remains the Lightweight King of Pancrase as he awaits his next challenge, perhaps looking to avenge his previous loss to Kuivanen from last July. In the co-main event, Sidy Rocha was crowned the Flyweight Queen of Pancrase with a strong showing against Takayo Hashi over five rounds. Rocha was the bigger, longer fighter and she used that size to her advantage as she was stalking Hashi across the cage through virtually every exchange during the 25-minute battle. Rocha did most of her damage in the early rounds while nearly chasing Hashi with a heavy barrage of punches that left her opponent with a damaged nose and blood streaming down her face. As time passed in the fight, Rocha (11-5-2) did start to tire slightly, which allowed Hashi (16-7-1) to come back with a few more counter punches once she wasn’t facing a constant fire fight from her opponent. Still when the fight was over there was little doubt that Rocha had controlled the pace and landed far more strikes over five rounds to win the title. 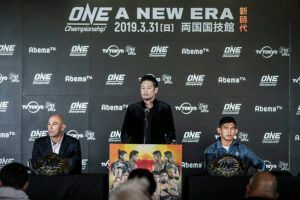 Both Rocha and Kume are set to be offered ONE Championship contracts under the terms of the partnership between the two promotions.